A borrowed cell phone VISUALLY penetrates a borrowed water bottle. Sealed inside, it must be removed at knifepoint! It's Impossible Phone Booth by the incredible mind of newcomer Kevin Cramer and The Magic Depot's latest creation! Borrow a cell phone from the audience or use your own. Also borrow a bottle of water from the audience and pour out any remaining contents. 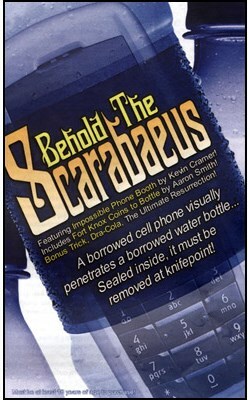 The cell phone visually penetrates the plastic bottle, falling inside a watery tomb! Powerful magic all bottled up! Visually works with ANY item! Use ANY plastic bottle, impromptu! The Scarabaeus, killer street-style magic! Visually insert ANY item, not just cell phones, to ANY plastic bottle! The item must be small enough to fit into the bottle, but it's open season on keys, kid's shoes, wallets, sunglasses, shot glasses, ANYTHING that fits in the bottle! Use a two-liter bottle and double the possibilities! You get The Scarabaeus gimmick, Insta-Ditch, an easy-open folding knife, complete instructions, PLUS a CD with video clips teaching you how to use The Scarabaeus for all sorts of routines, including Fort Knox Coins to Bottle by Aaron Smith!